Control user permissions to your billing account. Billing Account Administrators typically don't add or invite users to applications; it's up to each application manager to add and invite users for their applications. Once a user accesses an application in your billing account, Billing Account Administrators see their name listed on your account's Users with Access list. (To view this page, access the Manage Billing Account page and select the Users with Access tab). Each application has only one application manager. Generally, the application manager is the person who created the application. "Downgrade" his or her own role while always retaining the ability to restore it. In other words, an application manager can assign to himself a role that does not have user management permissions and always be able change back to his originally assigned role. Other users will be able to downgrade their role, but if the new role does not allow them to upgrade their role, they will not be able to restore their original permissions. Note: This functionality is not available to accounts on the Quick Base Essential plan. Transfer application ownership to another user. Once the application manager transfers ownership, the new user becomes the application manager. Application administrators are application users whose role allows full administrative permissions on the application. Application administrators can do almost everything that application managers can do (the exceptions are noted above). 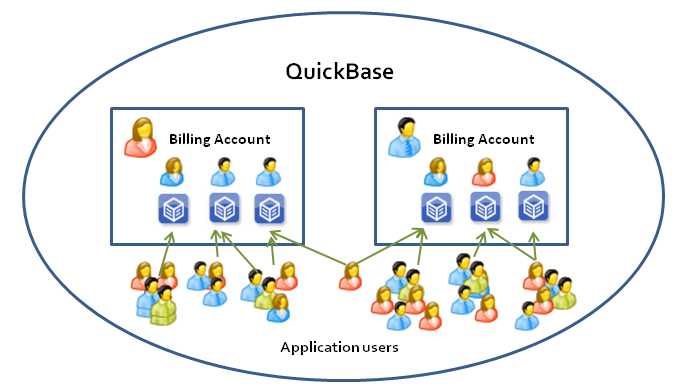 Application users are the people who have accepted an invitation to a Quick Base application. Any Quick Base user with sharing permissions in an application can invite and add other users to the application. Once a user accepts an invitation to an application, he or she belongs to the billing account in which the application resides. In addition, application managers can add the same user more than once in the same application. For example, in a small organization, you might want to add a user who will play different roles in your application. In this case, you could add two user records for the same user, assigning each a different role.